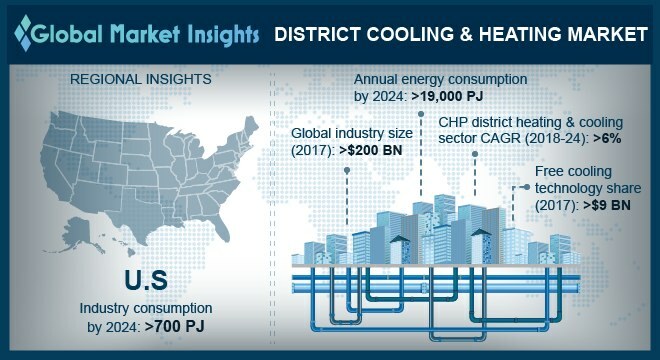 District Heating & Cooling Market size will exceed USD 400 billion by 2024, as reported in the latest study by Global Market Insights, Inc.
Increasing implementation of regulatory policies pertaining to carbon emissions coupled with growing adoption of sustainable energy technologies will stimulate the district heating & cooling market share. Changing climatic conditions on account of accelerating surface temperature range will boost the industry growth. For instance, the U.S. EPA under its Clean Air Act controls the release of air pollutants including NOx, SO2 and CO2 emissions. China district heating and cooling market is set to exceed the consumption of 5,000 PJ by 2024. Rapid economic growth along with large scale deployment of heating & cooling systems will encourage the product adoption. Escalating urbanization & industrialization on account of rising infrastructure development will influence the industry landscape. In 2016, the World Bank approved a loan of USD 100 million for the development of sustainable heating infrastructure across the Hebai province. Increasing investments toward the development of residential & commercial establishments across the emerging economies along with favorable regulatory policies pertaining to energy efficiency will propel the district heating and cooling market size. Technological advancement, ease of compatibility with various sources, lower thermal loses, and high operational efficiency are some of the underline parameters which makes its adoption preferable when compared with other conventional technologies. Commercial district heating & cooling market will witness a growth on account of growing adoption of building codes and standards coupled with the development of combined heating and cooling technologies to provide sustainable energy solution. In addition, the flourishing service sector across the developed nations along with rising investments toward real-estate industry will encourage the product adoption. Ongoing expansion of efficient heating infrastructure, innovative energy efficiency solutions and energy management systems will further accelerate the industry growth. Solar district heating and cooling market was valued over USD 4 billion in 2017. Ease of installation, lower operating cost, economic viability and environmental performance are some of the major factors which will propel the technology adoption. The European Commission, as per its SDH plan aims at deploying and promoting of SDH systems across Italy, Denmark, Germany and Czech Republic. The plan further aims to add a capacity of around 8 GWth by 2020. Ease of compatibility with various sustainable heating and cooling solutions will stimulate the heat pumps technology. In addition, the technology is widely accepted across residential and commercial establishments on account of there ability for trigeneration, providing electricity, heat and cool simultaneously. Increasing use of waste heat to generate energy thereby reducing the carbon emissions are some of the key parameters which will fuel the district heating & cooling market share. Key industry players across the district heating & cooling market includes Veolia, Vattenfall, ADC, Cetetherm, Tabreed, Shinryo, Engie, SNC Lavalin, Stellar, STEAG, Danfoss, Ramboll, Empower, Qatar Cool, Emicool, Logstor AS, Fortum, Pal Technology, Goteborg, Keppel, NRG Energy and Korea District Heating.